This treatment is often effective in allowing complete healing of early stages of periodontitis. Periodontal Scaling and Root Planing, typically referred to as a deep cleaning, is a conservative, non surgical procedure, which is meant to remove contamination and infection from below the gum tissue. SCALING removes bacterial plaque deposits, calculus, food debris and infection that has accumulated in the infected pocket due to periodontitis. 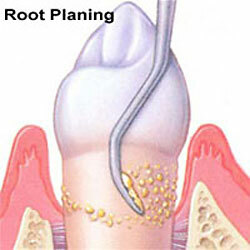 ROOT PLANING cleans and smoothes the root of your tooth so that the gum tissue may heal next to the tooth. Scaling and Root Planing is usually preformed in one section of the mouth at a time using local anesthesia for your comfort. This is a non-surgical treatment which is often effective in allowing complete healing of early stages of periodontitis and may reduce the level of surgical treatment needed.